Following representations by BGFF members to their local member Michael Sutherland MLA, seeking a deferment of logging in Warrup 06, the Minister for Environment Donna Faragher replied to Mr Sutherland setting out DEC's response to the request. The response by Dr Leonie van der Maesen, BGFF's international delegate and long-term forest researcher to points raised in the Minister's letter are as follows. Minister: "The Government's position is one of support for a sustainable native timber industry operating in accordance with the Forest Management Plan 2004-2013 (FMP)." Leonie: The Government deliberately misinterprets the meaning of "sustainable native timber industry". Comments on the Mid Term Audit of Performance Report from public and non-government organisations exposed the failure of DEC and the FPC to implement the environmental and sustainability provisions of the FMP. Minister: "The FMP is the overarching policy framework under which the Department of Environment and Conservation (DEC) manages activities on timber reserves, including timber harvesting." Leonie: Unfortunately the FMP is being implemented with a view to maximum timber production from available land, rather than truly sustainable management. Minister: "It was developed according to the Principles of ecological sustainable forest management and outlines a range of objectives and actions which are designed to protect multiple forest values." Leonie: The concept of ESFM is derived from the Montreal Process, Criteria and Indicators. From my investigations (1992 - 2010), numerous scientific reports and reports from ENGOs in WA, there is sufficient evidence that DEC and FPC are misinterpreting the basic principles. ESFM is defined as: "The management of ecosystems so that a full suite of biological species, ecological and evolutionary process of each ecosystem, is retained in the long term, even though short-term changes may occur." In the case of forest management, activities in the forest should be without undesirable effects on the physical environment. The social environment, which includes the total community and environment in all its aspects, must have high priority, with economic benefits only one of the factors. The local community should be consulted about all major forest decisions. The official report of a panel of experts set up by the then Minister for the Environment in 2002 made the following key recommendations in Part 1: "The outcome of recent research and monitoring provides a basis for a number of changes to the silvicultural guidelines to further ensure that forest management is consistent with principles of ecological sustainable forest management. These relate to improving the provision of habitat for hollow - dependent and arboreal fauna, better protection of soil and enhancing the protection of undergrowth vegetation" (Maesen, van der, 2007). Minister: "In keeping with the objectives of the FMP, DEC administers a rigorous environmental assessment process prior to approving timber harvesting. Harvest planning involves meeting the requirements of a comprehensive checklist ensuring strategies are in place to minimize the impacts of forest values"
Leonie: Investigations into Forest Management Practices since 1992, elaborate fieldwork in about 1 million ha and reporting of local communities, have indicated serious non-compliance, breaches of the Forest Practice Codes, and misinformation. This has been admitted in the mid term audit report of the FMP by the Conservation Commission (2009). Minister: "Safeguarding the biological diversity of the State's south-west forests is a key objective of the FMP. This is achieved on several levels; at the whole of the forest scale, through a comprehensive, adequate and representative conservation reserve system." Leonie: There is no scientific evidence that this "CAR" system is adequate. The remaining forests are seriously fragmented and degraded. Some endemic species are on the verge of extinction. "Horwitz and Calver (1998) found that Governments in the Western Australian RFA process were unwilling to acknowledge the existence of scientific disputation and Brueckner and Horwitz (2005) found that the overseeing government department agency regarded conflicting understanding of forest ecology as 'inferior'." (Taylor, 2009). Minister: "..and on State Forest and timber reserves through a network of informal reserves and fauna habitat zones from which harvesting is excluded ." Leonie: During the 2001 election campaign, the Government promised to protect old growth and high conservation value (HCV) forest. Since then unsustainable levels of logging have intensified. The damage to the environment is irreversible. The disturbance of the biodiversity of the forest ecosystem contravened international biodiversity agreements. Logging right up to the boundaries of informal reserves (including old-growth) without adequate buffers ensures that weeds, feral pests, fire, drying and wind effects penetrate well into the so-called "reserves". The fauna habitat zones are often isolated, with no effective corridors to make possible the migration of species in the face of climate change. This is environmentally, socially and culturally unsustainable. Minister: "At an operational level the impacts of harvesting are mitigated through the environmental management requirements to protect flora and fauna, identifying areas of old-growth forest for including in informal reserves, compliance with hygiene (dieback) protection, and retaining habitat trees and logs, midstorey vegetation elements and long-lived species such as grass trees in harvesting coupes. Leonie: All the above actions have been inadequately performed. My response to this statement is set out in detail in my Submission Report to the FMP Mid-Term Audit of Performance. During the 2001 election campaign, the incoming Government promised to protect old growth and HCV forest. Since then unsustainable levels of logging have intensified. The damage to the environment is irreversible. The disturbance of the biodiversity of the forest ecosystems contravenes international biodiversity agreements. It is environmentally, socially and culturally unsustainable. Minister: "During the development of the FMP, the conservation values in Warrup forest block were assessed in the Review of High Conservation Values in Western Australian South-West Forests." Leonie: This review was a desk study based on little available information, with no access to the field and inadequate funding and resources. "As a result of the review, a portion of the forest block not included in the Greater Kingston National Park was retained as State Forest and, as such, is available for timber harvesting". This is correct. That process was seriously flawed. The omission of part of Warrup was strongly opposed by BGFF, the Blackwood Environment Society and other ENGOs. Unfortunately CALM's focus on the quality and quantity of timber available in Warrup 06 exceeded its concern for conservation. Minister: "Additionally Warrup forest block is adjacent to the Greater Kingston National Park, Tone Perup Nature Reserve and the 4,144 ha Kingston fauna habitat zone." Leonie: That is correct. Therefore it should be part of Greater Kingston National Park. It is the last intact forest left unprotected. Minister: "The BGFF submission seeks to defer the logging until the impact from a changing climate on forest management is investigated." Leonie: This is not complete. There are other factors that are relevant. Comprehensive flora and fauna surveys have not been conducted and need to be done. The dying wandoo in the area needs proper investigation, and a study of the hydrology and increased salt levels is crucial in this area. The old-growth areas need to be protected from intrusive roading and logging. Minister: "The mid-term audit of the FMP is currently with the EPA for consideration, so it is appropriate that I allow this process to run its due course." Leonie: That is one of the reasons for an immediate deferral of the intended logging operation. Minister: "However, forest management in the context of a changing climate is recognised as an issue and DEC has instigated a number of projects which will identify adaptation measures into the second half of the FMP's ten year term and will also inform the development of the next FMP." Leonie: It is obvious that this will be too late for the Warrup block. Again, this is a compelling reason for deferral of logging. Dec has advised me that buffers around areas of old-growth forest were considered, but not adopted, during the development of the FMP." Leonie: Buffers were included in the discussion paper leading to the FMP but mysteriously disappeared in the FMP. Given the irregular shape of the old growth areas in Warrup 06, with a very large perimeter to area ratio and several deep intrusions available for logging, this is totally unacceptable. Minister: "I understand that within Warrup forest block there are isolated patches of forest available for timber harvesting within the boundaries of the old-growth forest. Where access to these patches would require the construction of a new road through old-growth forest this is generally not permitted but may be considered on a case-by-case basis and is subject to approval by DEC."
Leonie: Roading in a so-called protected area is unacceptable. It will increase the spread of dieback, open up the canopy, degrade the vegetation and undergrowth, destroy the soil and increase the risk of compaction. During my years of fieldwork in this area I have observed the impacts of the disturbance and the lack of regeneration. The side-effects will be serious. There is a serious lack of monitoring, recognised in the report of the Conservation Commission. Leonie: We have all participated in this process. It is totally useless. There is only one party which is right: FPC. It is paid to log, and that is what it wants to do. All the submissions, reports to the EPA, and even to Ministers are ignored. Minister: "In response to the submission's comments regarding the protection of water values in Warrup forest block, considerable research has been undertaken into the effects of timber harvesting on groundwater levels and stream salinity." Leonie: The results described at that time may no longer be applicable because of the declining rainfall. Minister: "Findings from this research led to changes in forest management practice and subsequent enhancements introduced under the FMP have further reduced the risk to stream salinity from timber harvesting. I have recently approved the Guidelines for Soil and Water Conservation, which will aid in further protecting the water values in State forests." Leonie: I have not seen that report. However I would like an independent hydrologist like Prof. Hendriks of the Dept. of Physical Geography, Utrecht University, to study it. Minister: "Given the thorough review and planning processes undertaken as part of the development of the FMP, and the adequacy of representation in the reserve system of conservation values that occur in Warrup forest block, the Government does not believe there is sufficient basis on which to defer logging in this area." Page 9. parts 4.1, 4.3, 4.4, 4.5 indicate that research is still required that could justify the Ministers statement. 4.1 Assist with the development of a framework for designing a CAR reserve system. Aimed for completion by July 2010. Response = Logging Warrup could impinge on outcome by limiting options. Response = Warrup should not be sacrificed for ongoing research. Knowledge is clearly deficient to justify Minister's statement. Response = The proposed logging in Warrup should not be implemented before a Forest Health Surveillance system is in place. Knowledge is clearly insufficient to justify the Minister's statement. 4.5 Assist with the development of a conservation reserve biological database to support reserve management. Scheduled for completion by January 2012. Response = The values in the conservation reserve system are still to be documented, let alone the values in Warrup. Knowledge is clearly insufficient to justify the Minister's statement. Loss of habitat is the primary reason for the decreasing native forest fauna populations, with some species near the point of extinction. If there was "the adequacy of representation in the reserve system of conservation values occurring in Warrup forest block", eight species of Flora and four species of Fauna would not have gone to a higher category of threat under the Wildlife Conservation Act 1950. Refer: Hansard [Legislative Council, Tuesday, 10 March 2009]. Ecologically sustainable forest management has obviously failed and the Warrup mixed old-growth / high conservation value forest should be added to the reserve System and not logged under any circumstances. Elaborate studies of the Kingston area have been carried out by CALM and the Utrecht University, Holland in collaboration with CSIRO. Yearly reports were provided to the Chair of the EPA and the Minister for the Environment. 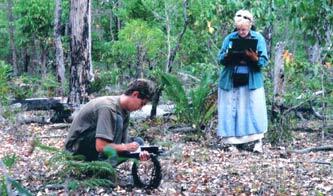 This independent study, conducted over a long period of time, with remote sensing and vegetation change detection has produced scientific evidence that not only is the Warrup forest block WA's last remaining intact State forest still unprotected but also that the logged forest will not regain its former quality. I have been making these exact same points for over twenty years to different Environment Ministers, and it is apparent to me that they are still being fed exactly the same misinformation by their advisers in DEC and FPC (and CALM before that)..
Forest management in Western Australia is ecologically unsustainable, socially unacceptable and economically unviable. The proposed logging will occur in the last remaining extensive tract of high quality mature forest in Warrup block that was excluded from both the adjacent Greater Kingston National Park in 2004 and the adjacent Interim Kingston Fauna Habitat Zone in 2005.